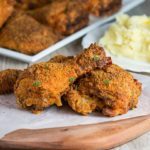 Breaded chicken doesn't have to be greasy - this oven-baked version is low fat and packed full of flavor! 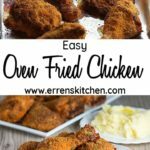 This low-fat recipe for Easy Oven Fried Chicken makes a delicious, crispy coating that’s baked making a healthy alternative to deep fried. Don’t you just love fried chicken? I know I do, but dragging out the deep-fryer every time I want to make it is not ideal. Plus, who needs all that fat? 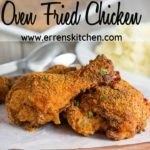 It’s a low-fat oven fried chicken that’s really tasty with virtually no added fat. Using low-fat cooking spray allows the crispy coating without deep frying. Using legs and thighs assures the chicken is moist and juicy. This recipe is probably one of the recipes I make the most for my family out of all my recipes. I make it with most with Rice Pilaf, Roasted Broccoli or Roasted Brussels Sprouts. It’s so quick, easy and unbelievably good, that my family asks for it on a regular basis. I probably make this chicken 3 or 4 times a month and for a food blogger that has to constantly cook new dishes – that’s a lot! 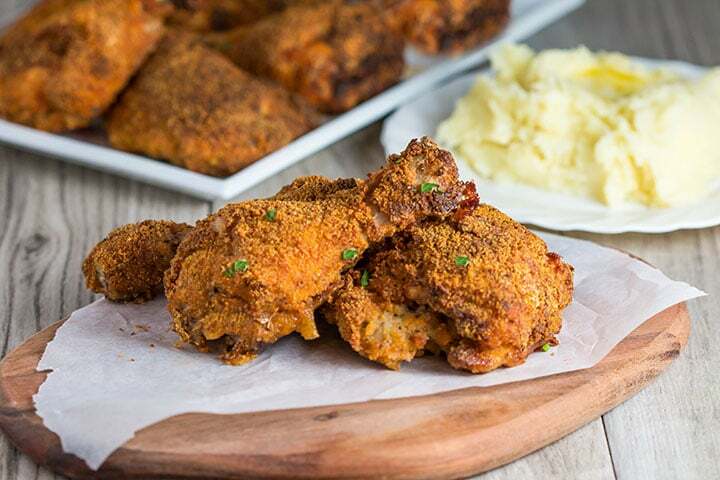 For the breading, I use a layer of flour and a layer of plain breadcrumbs that I season with oregano, garlic powder, paprika Parmasean Cheese, salt and pepper. You can alter the recipe in any way that suits you and your family. 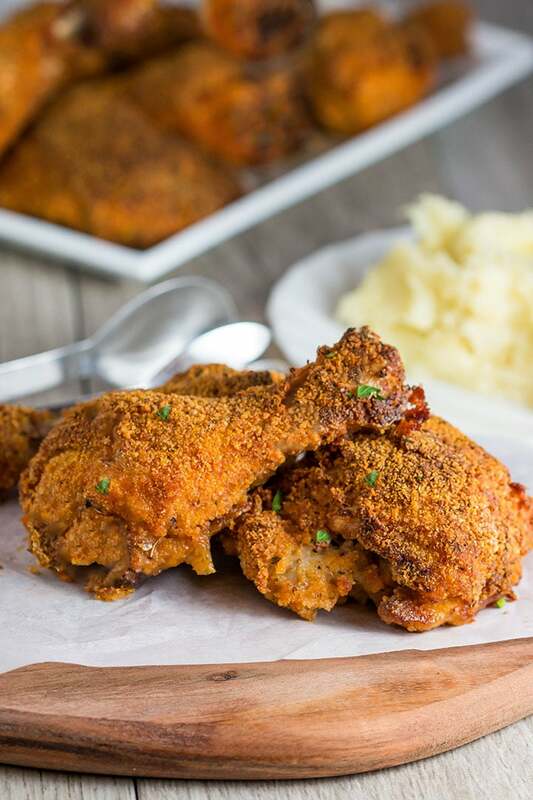 Make it your own – use pre-seasoned breadcrumbs or any herbs and spices you want. If you like a little kick, add some cayenne pepper. Don’t like Parmesan cheese? Take it out – the choice is yours! 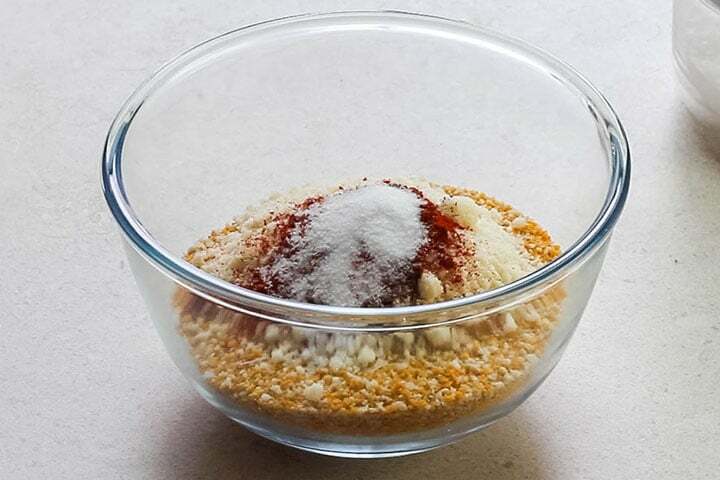 Put the bread crumbs in a bowl with the oregano, garlic powder, paprika, Parmesan cheese, salt & pepper. Mix it together and add it to a large food storage bag. Beat the eggs with the milk and salt and pepper in a bowl and add the flour to a dish and season with salt and pepper. Line them up next to each other to easily coat the chicken in each. 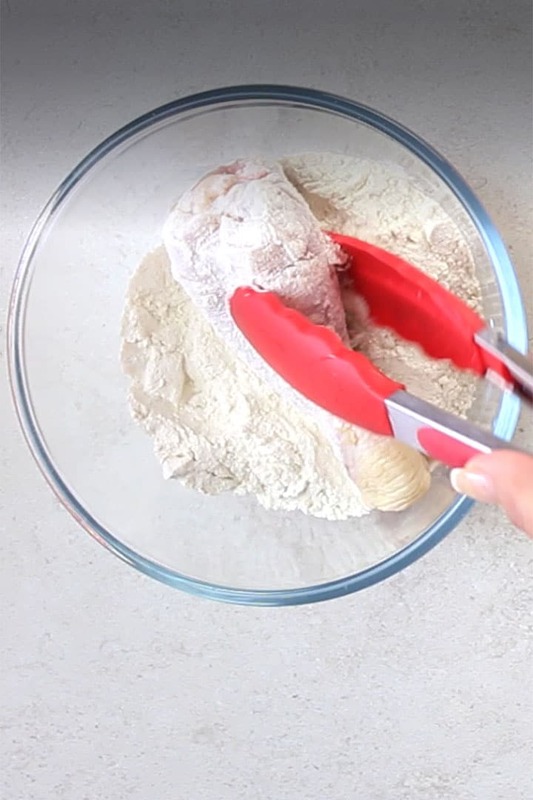 Dredge the chicken piece by piece in the flour. Then add it to the bag with the bread crumbs (I usually add three pieces to the bag at a time). Seal the bag well, and shake the bag to coat. Place on a baking sheet (I line mine with nonstick foil). and spray with low-fat cooking spray. Bake in the preheated oven for 30 minutes. Check to see if the chicken has browned. If needed, spray with more cooking spray and bake another 15 minutes. Remove from oven and rest on paper towels. Enjoy! Use Chicken pieces that are uniform in size. 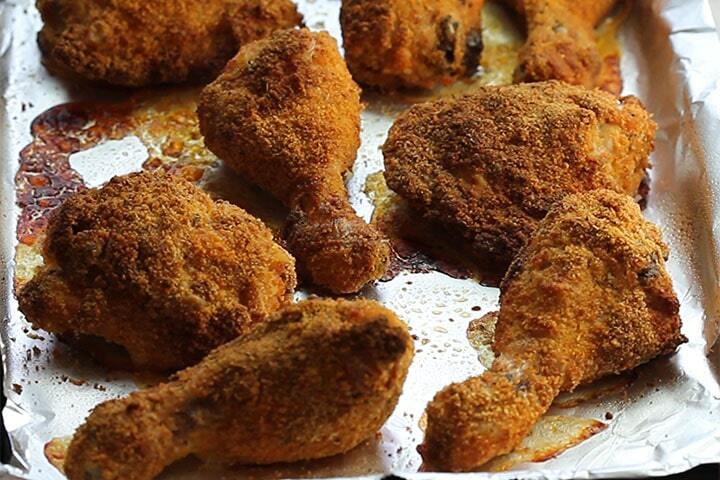 When oven frying chicken, use one cup of chicken or two similar sized cuts so they have the same cooking time. Always use bone-in chicken pieces with the skin on. 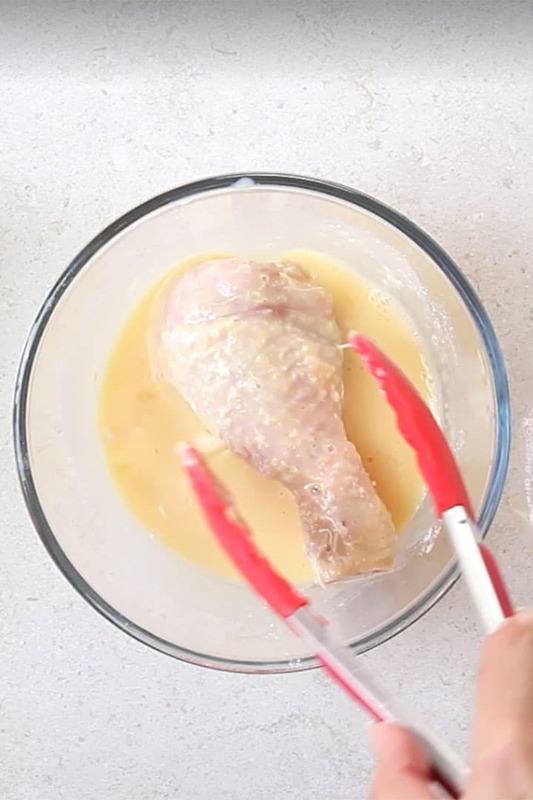 Using boneless chicken without skin will come out dry. Season Generously. 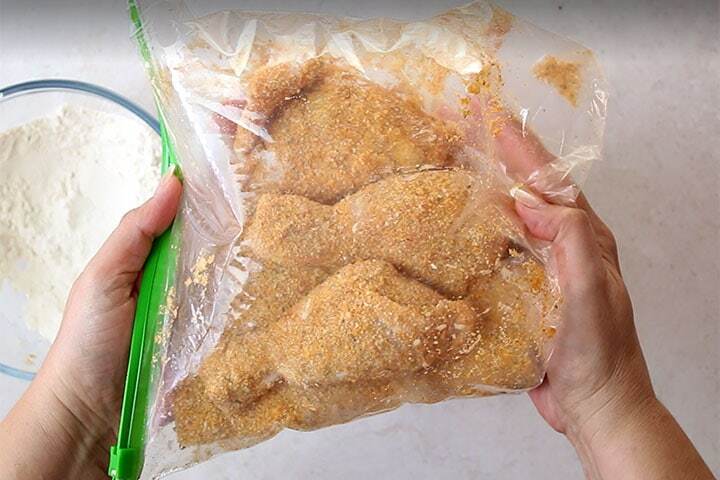 When making oven fried chicken, season your chicken with salt at every stage. Add salt and pepper to the flour and egg mixture. It’s hard to get any seasoning into the meat, but seasoning throughout the entire process will help ensure it’s extra flavorful. Don’t Crowd the Pan. Overcrowding the pan will cause steam and make your breading soggy. If necessary, cook on two sheets. Don’t Cover with Foil. Many people think that covering a pan with foil during cooking will keep it from browning too much, but this will create a seal and cause condensation which will make the chicken soggy. For a spicy kick, add cayenne pepper to the coating. 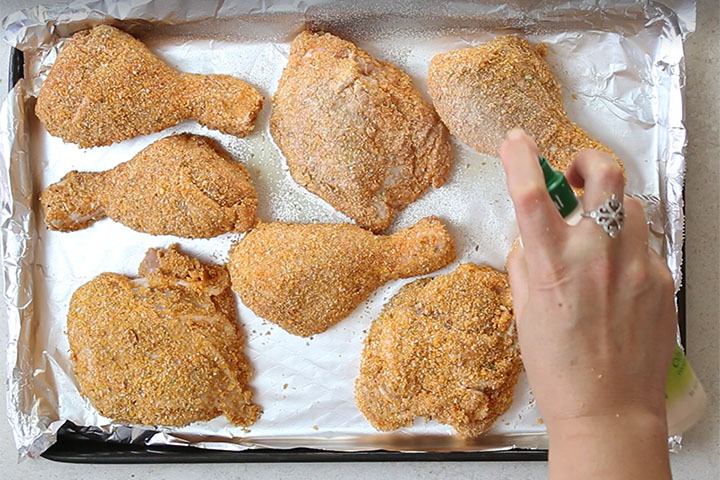 For an extra crispy coating, try using panko breadcrumbs in place of regular breadcrumbs. Place flour in a plate or bowl and season with salt and pepper to taste. Set aside. Put the bread crumbs in a shallow bowl and mix in the oregano, garlic powder, paprika, Parmesan cheese, salt & pepper. 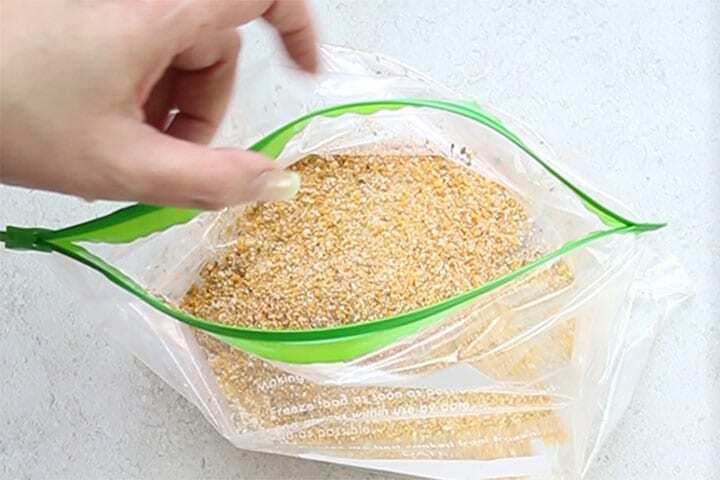 Add the breadcrumb mixture to a sealable food storage bag. Beat the eggs with the milk and season with salt in another bowl. Dredge the chicken piece by piece in the flour, followed by the egg and then add to the bag with the bread crumbs (three pieces should be added to the bag at a time). Seal the bag and shake to coat with the breadcrumbs. Place the chicken in a dry 9x13 inch baking dish lined with nonstick foil. Spray with cooking spray. Bake in the preheated oven for 30 minutes. Check to see if the chicken has browned. If needed, spray with cooking spray and bake another 15 minutes. Remove from oven and drain on paper towels. Enjoy! Don't Crowd the Pan. Overcrowding the pan will cause steam and make your breading soggy. If necessary, cook on two sheets. Don't Cover with Foil. Many people think that covering a pan with foil during cooking will keep it from browning too much, but this will create a seal and cause condensation which will make the chicken soggy. I never try a recipe for guests on the first go, but I did this time….and I used chicken breasts. It was great! Not dried out, tasty (I added extra parmesan cheese) and so easy. Now I wonder if it can be prepared ahead and frozen for later use? Thanks so much! I am thinking of making this recipie. I am wondering if you cover the pan when baking. Thanks! You mean the pan its self or the chicken. The chicken isn’t convered, but you can line the pan with nonstick foil if you’d like. Oh my goodness! This was delicious! It was so tasty. Chicken had full flavor, didn’t get dry or burnt with instructed heat and timing. I also used low-fat milk. I also baked Asparagus seasoned with black pepper, sea salt and topped with cherry tomatoes in a separate baking dish for 15 mins. It was an awesome side dish. Wow, Ejrin! That sounds amazing! So glad you enjoyed the recipe! Made this recipe tonight and the chicken turned out delicious. Thanks for the recipe. Hi Michelle, that’s so great to hear. Thanks so much for the feedback!